Tatewin Means, J.D. is currently the Deputy State’s Attorney of Oglala Lakota County and Graduate Studies chair at Oglala Lakota College. She earned her B.S. 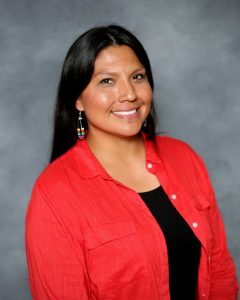 in Environmental Engineering from Stanford University in 2002, her Juris Doctor from University of Minnesota Law School in 2010, and her Master’s in Lakota Leadership and Management from Oglala Lakota College. She was previously Attorney General of the Oglala Sioux Tribe. Tatewin is a member of the Sisseton Wahpeton Dakota and Oglala Lakota tribes and grew up on the Pine Ridge Reservation. She has two children.